Welcome to our first showcase of 2019! You will notice that we made some changes, and added useful information to each of the featured websites: the name of the designer, the theme, and the plugins they used. Among the sites on our list this month you’ll find a law firm from Oregon, a hotel chain from the Netherlands, a wild camping company from Sweden, and a design magazine from Israel. 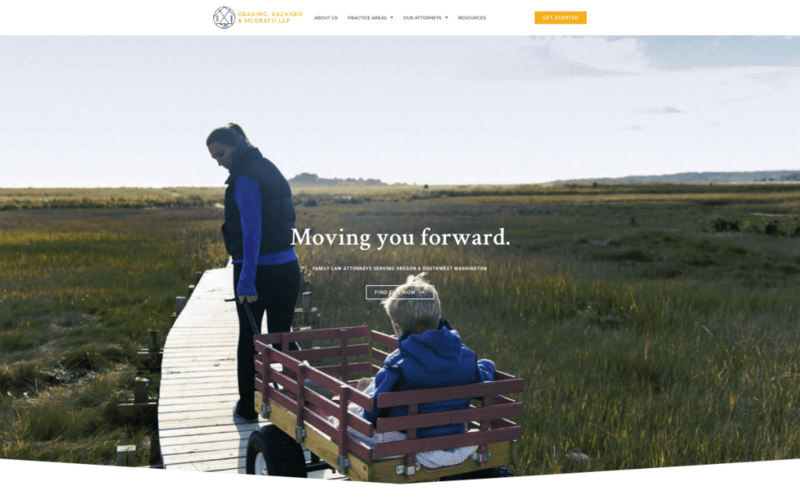 This site belongs to a Portland, Oregon based family law firm that wanted to appeal to a new client base of people in their 40’s, while not alienating their older existing clients. We loved how the design and the messaging perfectly correspond with the firm’s expertise of divorce and separation. In particular, we liked the multi-scroll section split into two sections, with a vertical scroll going in opposite directions. We feel the designer managed to create a positive look & feel, helping to shape an optimistic outlook even in difficult situations like divorce. The beautiful logo design and the needle tree icons reflect the forested and mountainous landscapes of the Pacific Northwest, where this law firm is based. Plugins: Essential Add Ons Elementor, Ultimate Add Ons for Elementor, ACF Pro. A “jeans & t-shirt, football-lovin’, Midwestern girl who likes paper”, Dana Osborne designs creative custom invitations for large events – weddings, corporate events, anniversaries, etc. She also does print and web design for businesses. 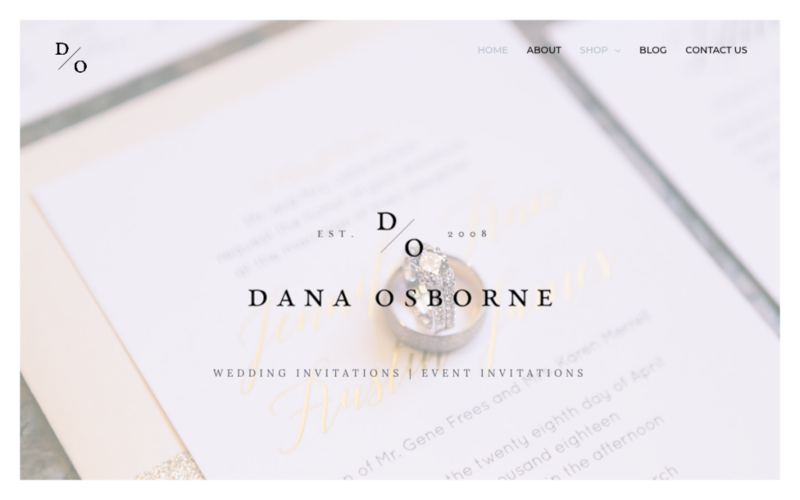 Dana’s website design is simple and functional with a coherent layout. This is a fine example of a professional looking site, planned down to the most minute details. It demonstrates Elementor’s capabilities in delivering beautiful outcomes for small businesses with a limited budget. Plugins: Social Warfare, El Insta Stream, Ultimate Elementor, Contact Form 7, Header Footer Elementor, Instagram Feed. 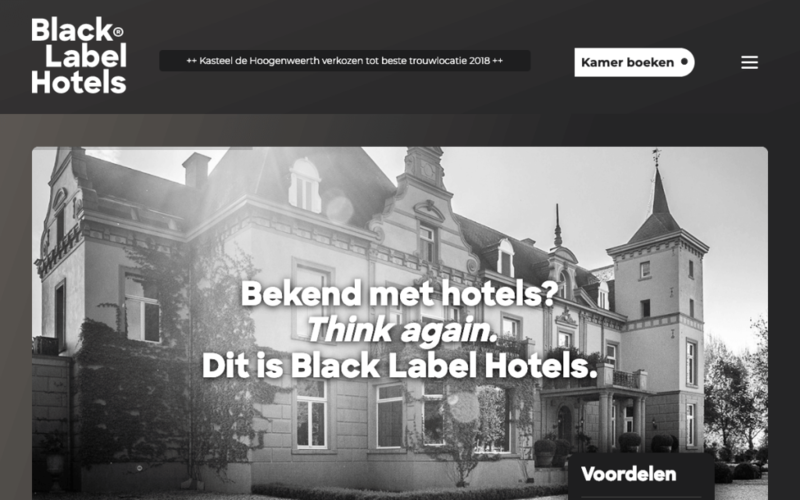 This is a custom-designed website for Black Label Hotels, a hotel chain in the province of Limburg in the south of The Netherlands. It currently has two locations in Maastricht (Castle Hoogenweerth) and Valkenburg, but there are already plans for a third venue. To create their website from scratch, the designer used a custom-made theme, some additional CSS to build different layouts for all the pages, and of course – Elementor. He positioned different visual elements, like the map, outside the section borders, creating a 3D experience. The design elements that separate between the sections make the texts more readable and inviting. Plugins: Google Analytics for WordPress by MonsterInsights, Gravity Forms, Responsive Menu, Slider Revolution, Wordfence, Yoast. 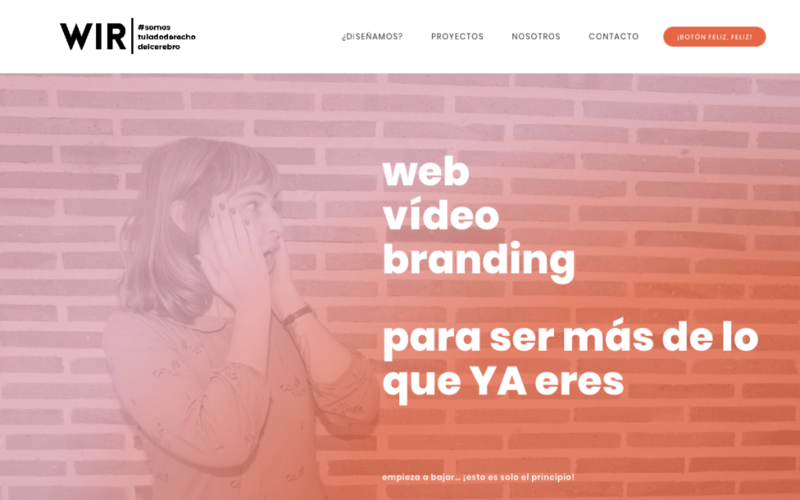 WIR is a web, video, and branding design studio from Madrid, run by Ana Gadea and Ignacio Sánchez. Ana and Ignacio designed a website that truly reflects their vibe and lets their cool personalities shine. They use funny GIF animations on the back side of the Flip Box widgets, which managed to surprise us, as well as non-standard icons, devil horns, and funny messaging. On their About Us page, they introduce a 3rd member, again in an amusing way that quickly captured our attention. Very cool! Design: Ana Gadea and Ignacio Sánchez. 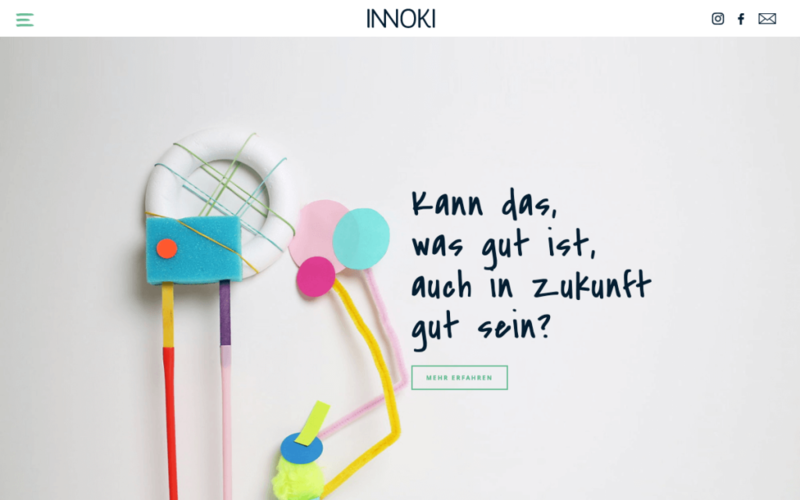 Innoki is a design thinking agency, based in Berlin and Göttingen. Innoki uses the design thinking method to consult big brands in the fields of automotive, insurance, and many more. The process of design thinking helps them discover in cooperation with their clients new forms of innovation. Their website has a clean layout throughout the pages, producing a “European” atmosphere. The connection between the Craft and Digital is well executed, in terms of images and texts. The pictures are undoubtedly the center of attention, here the texts just support them, letting them speak for themselves. The colorful palette corresponds well with the vivid pictures, making the visit experience pleasant. Plugins: Elementor Addons & Templates – Sizzify Lite, Elementor Inline SVG, Full Screen Menu for Elementor, Cookie Notice, Duplicate Post, Easy Smooth Scroll Links, Google Analytics for WordPress by MonsterInsights, NavMenu Addon For Elementor, Redirection, Schema, Simple 301 Redirects, Velvet Blues Update URLs, W3 Total Cache, Yoast SEO. 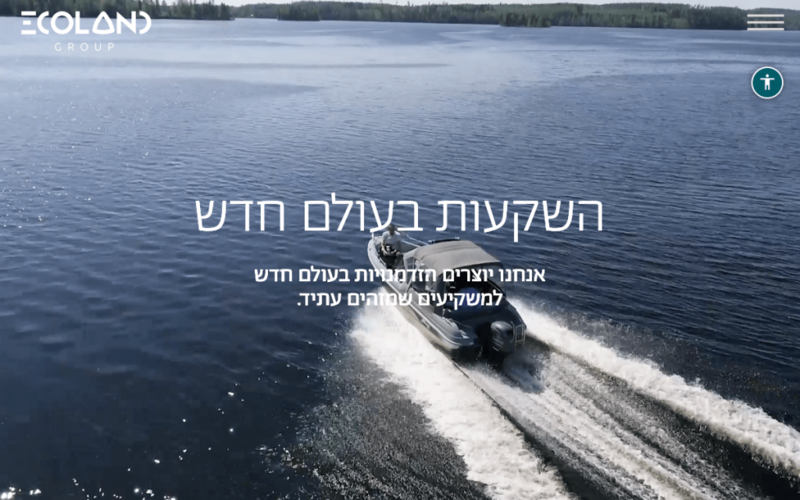 Ecoland Group is an Israeli company that discovers markets with growth potential (like the cannabis industry), invests in them, and makes them accessible to investors. The company manages investment paths along with dozens of professionals from different industries in Israel and abroad. Ecoland’s design is sophisticated, without being pretentious. When you visit the page, you are actually taken on a journey, starting with the hero images and continues left and down upon scrolling. Each screen reveals a new field of expertise that the company specializes in, using concise and precise copy. In each one of the screens, we notice the company’s logo (E) integrated in a different creative way, fitting in to the overall design. Plugins: Accessible Poetry, Advanced Custom Fields, CF7 – HTML Email Template Extension, Contact Form 7, Duplicate Post, Dynamic Animations for Elementor, Header Footer Code Manager, Hummingbird Pro, Jquery Validation For Contact Form 7, Responsive Menu, Smush Pro. 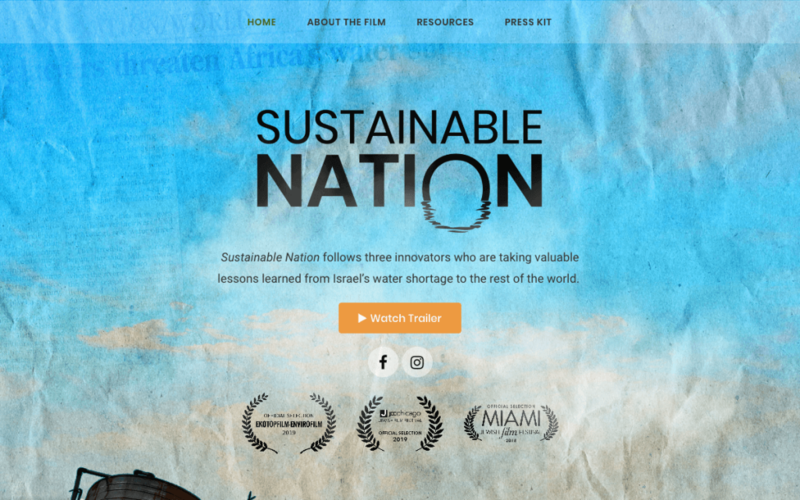 Sustainable Nation is a new hour-long documentary, following three individuals who are doing their part to bring sustainable water solutions to an increasingly thirsty planet. The promotional site has a different and interesting design. Built from scratch, the overall design of the image collage is simply excellent. The color palette works well with the pictures, and the fine typography, which is reminiscent of newspaper font, fits perfectly together. It’s fun to see how old print design is brought into the digital world. The composition of different newspaper clippings that creates a whole photo, is highly creative and inspiring. And, of course, it stays on topic with the subject of sustainability. Plugins: Ultimate Addons for Elementor, Yoast SEO, Google Tag Manager for WordPress. Do the North are Thomas and Helena. Many years ago they came up with the idea to try to capture the amazing freedom of wild camping & kayaking in Sweden, and do it for a living. Since 2004, they have been sending eager adventurers into the gorgeous terrain of Sweden where few foreigners ever venture. 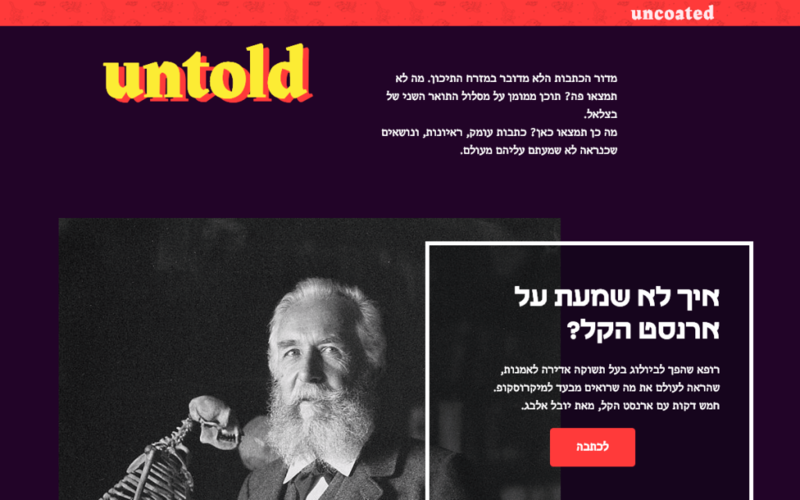 Believe it or not, this is the first site that this design team ever built with WordPress. They had decided to look into a page builder solution and came across Elementor. In our opinion, the result is outstanding. While the layout is quite simple, once you land on the homepage you immediately start enjoying the experience of wild camping and kayaking in Scandinavia, thanks to the selection of beautiful high-resolution images, especially the hero image. The icons are simply charming and the logo completes the Nordic vibe. We liked the mega-menu they used, as well as the sticky menu in the inner pages. You should be proud of yourself, guys! Plugins: Google Analytics Dashboard for WP, MailChimp for WordPress, Official Facebook Pixel, Anywhere Elementor Pro, Yoast SEO, Duplicate Post. An Israeli online magazine for designers, Uncoated is an excellent illustration of Brutalist design, characterized by dominant basic colors that complete each other, asymmetrical structure, and creative and funny copy. The combination between the images and the copy are superb, and the use of floating CTA boxes as Read More buttons are also nicely executed. The designers did not shy away from bold combinations of color and content, and it paid off – paradoxically these combinations ultimately create harmony. Plugins: Google Analytics Dashboard for WP, MailChimp for WordPress, Official Facebook Pixel, Yoast SEO, Duplicate Post. 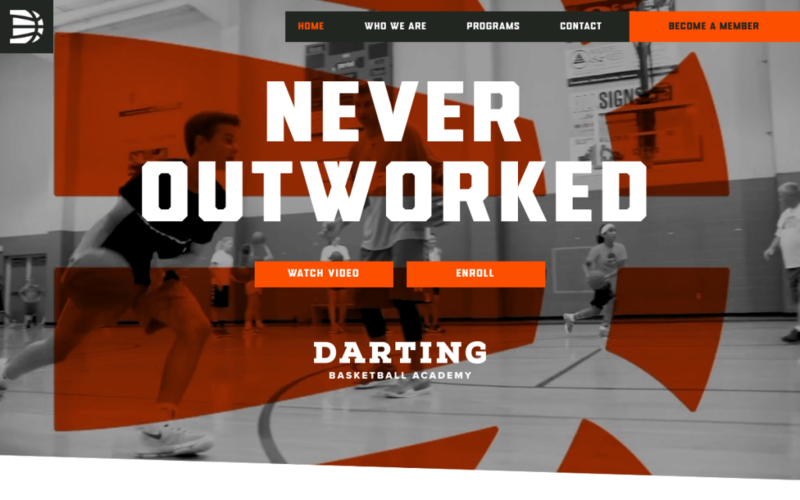 Darting Basketball Academy teaches the foundational movements and techniques mastered by elite players, offering programs to each player’s abilities and areas for improvement. Their website is all about basketball: Dynamic, dominated by the color orange and displaying stats. The layers appearing on the video above the fold, transition into the sections below, using background images with similar patterns. The internal pages maintain the same consistent colorful design, making the website visit entertaining. Brilliant! I have some clients that are worried about their Elementor sites score on Google Page View. It made me try all sorts of optimization but not with much luck. A random test of 6 of these (beautiful) sites confirms that it is difficult to get Elementor sites out of the “red zone”. Especially on mobile. Do you have any inputs to this? An easy fix? Or something clever to say to our clients? Most often the argument seem to be “speed is actually the only important parametre – a bad score on Google Page Speed is not a problem” – but can this really be true? Elementor and Astra Theme together are a great platform. FAST! Your clients – tell them, it depends on what they (really) need (to have). If you are the author, who develop their sites, it is your job, to find out these things. Perhaps a builder is not necessary and in some cases they are good to go with a light theme, only. There are so many discussions out there about builders. More code, more plugins and endless gadgets ends up with slower speed. As far as I know there is no all in one super duper “I do it all” solution on the market. Check, if it is really necessary to have the 120 animations and check, what visitors do say about them. Most of them want the information, they have been searched for, only. Quick and on point. More and more come with cellphones, they do not need the high resolution 2500 pixel picture or start playing the whole billboard chart, while loading the page. Or even think about the popups – they can be a help to a visitor in some cases, but most of the time they are annoying, only. Use, what it (really) needs and you are good to go. This is very true and something I also struggle with. I just discovered a plugin called Clearfy that allows you to switch off various js and css files on a page basis that helps with page load a lot, and reduces the amount of requests for unused files that Elementor adds by default. Guys you really need to think about performance now. Since we use elementor to design the entire page, the plugin could also workout which styles and js is being used and ONLY load those into the page as critical above-the-fold css? As it stand, half the files being loaded by Elementor are NOT used. You can use Autoptimize for now and force all CSS to be loaded inline and this does help, but Elementor does need to lose some weight. Im having the same issue on mobile. Trying everything. Would love suggestions because Elementor is so easy for my team to use, I just wish it were faster. I would love to know which combination of plugins you have used for this? Totally agree. That Sustainable Nation site has about 5Mb of pictures downloading on the front page. The Uncoated Magazine site has one pic that is a 1Mb png, that could easily be a 30k jpeg. Designers need to pay attention to page load speeds and learn how to scale images properly. I know everyone’s got lots of bandwidth now, but sheeesh! Wow! Just when you thought you’ve got a cool website, articles like these helps to keep website owners humble. Quite insightful to see other developper’s ideas come alive. Does anyone know how to set up the “FIND OUT HOW” but in Number 10 header. When you click on it, it scrolls down to a specific point on the page. Any ideas? You ad an id to the element you want to scroll to and make a link to that Id. E.g. You create an ID link. E.g. Use the anchor object. Then link #object setting in the anchor doesn’t include the hash just the text. Hi I’m not a developer but I’m pationate about WP and I specifically looked for a web developer experienced building with elementor for my website – would anyone in the community be willing to give some feedback- I’m all ears for improvement. One of our plug in is not working well – Caldeira Forms and I’d appreciate some advice! Also whats is Google PageSpeed Insights for? I look forward to hearing from the community!! Your website is awesome! See this https://gtmetrix.com/ for customization. Cheers! These websites inspires me.Everytime I visit them I get new ideas.I am going to include some color combinations. ¡¡¡GENIAL!!! En lo que termine de hacer mi sitio lo envío. Is there a way to submit a website design for being featured in the sites of the month? Thanks! Google PageSpeed Insights scores of all these pages are very low. Google is now making it almost mandatory to have a good score for a mobile view. I love Elementor for how easy it is to build beautiful WordPress sites, but it is useless for any business application standpoint of view, because of impossibility to hope for organic traffic and the effectiveness of SEO. Do you have any specific plans on improving Elementor produced code base to ensure that Google PageSpeed score is improved and shows in the Green zone? How do you decide which is the best of each month? How do I send my sites? Some terrific inspiration here – and design reminders. The use of orange from the basketball is inspired and a perfect example of the power of simplicity. I’m particularly enamoured with the Do The North website (aside from making me jump on the next flight out of Australia) with its ease of use and deceptive simplicity. So much hidden bonus content! Lovely. Great collection – look forward to the next group! Basketball Academy and Do The North. The others were a snooze. Google Pagespeed Insight scores 99 on mobile and 100 on desktop. GTMetrix 100 and Yslow 99. Site running on Siteground with free Cloudflare account for CDN. This was just a test I did last weekend. The score will most likely get lower once you start adding content. But it’s definitely possible to get a good pagescore using Elementor. @kasper. I hope the URL given was not the Test site you did last weekend? A more reliable test would be to use one of Elementors Page Templates. Hi Rod. Not sure – made a couple test last weekend. Scores 92/100 in Google Pagespeed. Did not try GTMetrix yet. But GTMetrix is a bit behind. For example they are they flagging sites using Brotly compression instead of gzip. This is all wrong. Brotly is newer and more efficient. Generally PSI is much more upfront and advanced than GTMetrix. BTW. load time for the above template is as low as 250 ms which is the most important thing here. How to make different tabs using elemntor? I want to make different tabs for different chapters. And want to put pdf in each chapter. Elementor is amazing. Really talented impressive holistic design work. I was surprised to see particularly the Israeli page loading pretty slow. 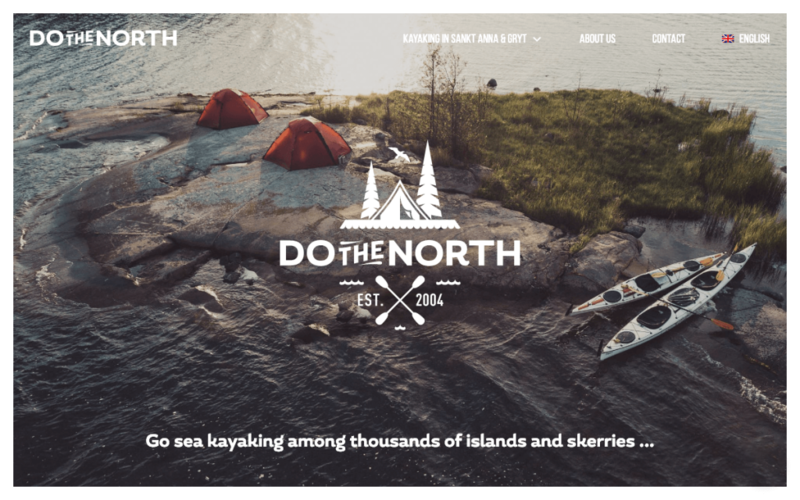 Probably my favourite design is the “do the north” website. I’m curious, do you know of any successful design that has a sticky sidebar in their blog posts? Can you post something whose theme is storefront? Would love to see some ideas. Love all the themes and designs featured here. But maybe you can also profile different types of sites? Blog, landing page, online shops, woo commerce? Anyway, thanks for the showcase. It’s amazing and super inspiring.